Waking up yesterday morning to a thermometer reading -1F (-18C), and the weatherman saying this is just the first day of a weeklong freeze, made me want to channel my inner bear and claim my blanket-igloo until it’s over. NYC doesn’t stop, however, just because the winter is finally here, and figuring out how to stay warm while still looking fashionable got me motivated enough to brave the winds outside. My blue Callixta cashmere sweater is one of the warmest things I own, so I started building this outfit from that. I added a mustard yellow turtleneck underneath and a camisole under that, for that necessary layer trick. 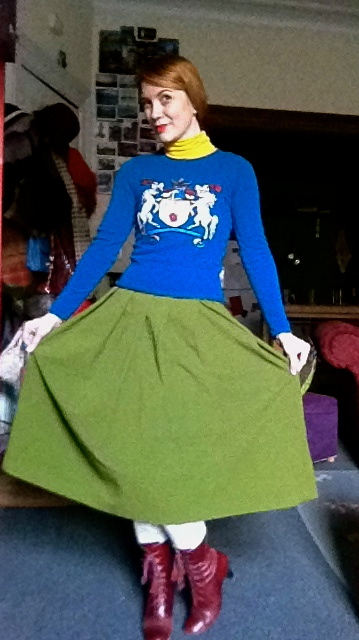 On the bottom I wore my thick green vintage skirt and double-tights. I really wanted to wear the white Betsey Johnson ones because they are cashmere and have these cute heart cut-outs, but I knew they wouldn’t be enough, so I wore the fleece-lined black ones underneath as well. 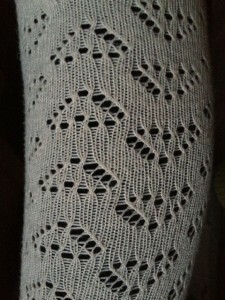 To keep the skirt from getting staticky and sticking to my legs as I walk, I wore a long slip underneath it, also giving myself another layer against the winds. 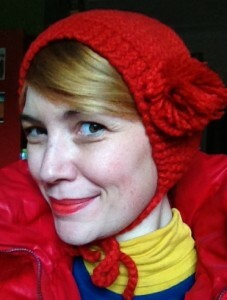 I’m a bit vain when it comes to hat-hair, so I was thrilled when I recently found this adorable red wool Carolina Amato caplet. 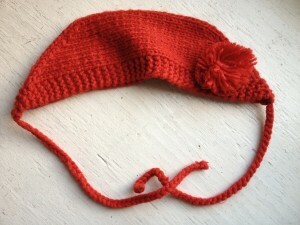 It makes me think of Dutch milkmaids and it’s wonderfully warm against my ears, while still keeping my hair pretty. 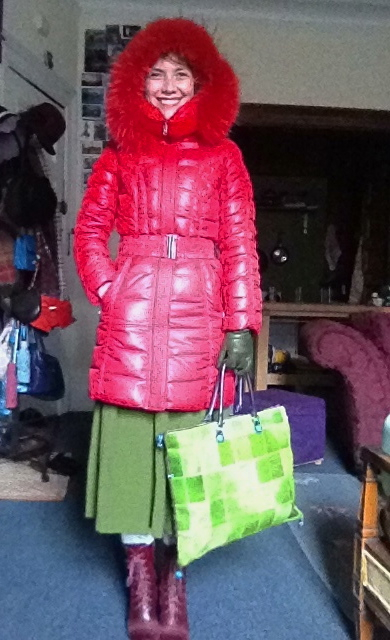 Over all that I wore my winter go-tos: red Snowimage puffy coat, red Miz Mooz boots and green leather gloves with cashmere lining. The green Gabs bag that I got as a gift from my mom years ago completed the look.